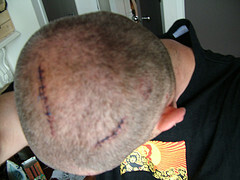 Hair Transplant Without a Scar? The long linear scar that can be the result of certain hair transplant procedures have been highly discussed in recent years. Especially the Strip hair transplant procedure, which removes a strip of skin from the back of the scalp, the scar can become a big concern. And while there are individuals who are ok with having a thin scar, there are those absolutely do not want any type of scar as a result of hair transplantation. The FUE (Follicular Unit Extraction) hair transplant method is known to produce much less scarring, but clients should be aware that this method can result in tiny, pimple looking marks, as many as hundreds or thousands, depending on how many hairs were transplanted. These small marks may never be visible to anyone, but the client should be aware that they can occur. But over time, there is a possibility that they will fade. And while the FUE can certainly result in some very minimal scarring, it absolutely does not result in a long linear scar on the back of the head. A wide spread belief is that the FUE hair transplant does not result in any scarring, however, some doctors believe it is not fair to say that it doesn’t. And yet another group of doctors insist that the FUE is a completely scar free approach. Much of this has to do with the individual opinion and belief of the doctor. But how skilled and experienced the hair transplant doctor is, as well as how advanced and refined his tools are play a very big a role in the scarring with any type of hair transplant. With tools that are as small as possible, and an exceptional technique, scarring will be minimal. When it comes to the Strip, an average doctor may not know better than to leave the client with a visible scar, but a skilled doctor will know how to operate in order to leave as small and thin of a scar as possible. Hair transplant doctors can employ the trichophytic closure technique which essentially will be very thin, close to non visible, because hair is made to grow through it. When it comes to hair transplantation, not having a scar can be especially good if the client ever chooses to wear their hair in a short style. But if the client always wears their hair long, the scar will be hidden by the overlapping hair. But as technology advances, tools and techniques get more refined, and there are doctors who insist the scar from a Strip procedure will be paper-thin and not visible to anyone. Still, it is safe to say that the FUE does not produce much scarring at all, and definitely not a long linear scar as the Strip does. Individuals who are concerned with the thought of having a visible scar should definitely go with the FUE hair transplant.